The only really detailed gunsmithing and repair manual on these Colt revolvers ever printed. 100's of crystal clear photos and illustrations. Click here for a sample page from the book. 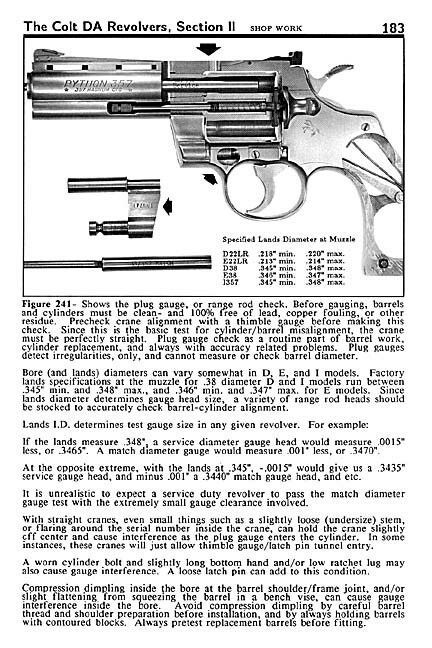 Covers troubleshooting & problem solving, parts inspections, and complete repair, rebuilding, timing & accurizing of the Colt D, E, & I Frame models, including: Python, Detective Special, Official Police, Diamondback, Agent, first model Trooper, Police Positive, Officers Model Target, Army Special, and other Colts with similar lockwork. Although parts size is larger (a matter of scale), the theory and fitting procedures in this book also apply to the large frame Colt New Service, Shooting Master, and 1909~1917 U.S. Military models. Special emphasis is placed on rebound lever fitting and adjustment; cylinder bolt fitting; cylinder hand fitting and adjustment, and proper interaction of these critical action parts to provide instant bolt pickup, on-time cylinder rotation, and correct cylinder bolt drop timing. This book cuts through and dispels all myths about these superb revolver actions. Bench edition - 224 pages with plastic laminated soft cover. $37.95 U.S. See order form for domestic shipping options.